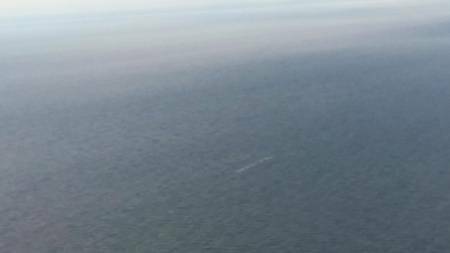 Crews continue to investigate a reported discharge of an unknown substance from the site of a sunken barge near Kelley's Island Shoal in Lake Erie, Monday. The Unified Command, consisting of the U.S. Coast Guard and the Ohio EPA, is continuing to take all necessary actions to ensure the safety of the public and the environment, the U.S. Coast Guard said in a press release. At 9:30 a.m., members of the Coast Guard Atlantic Strike Team and a crew from Coast Guard Station Marblehead, Ohio, aboard a 45-foot response boat transited to the scene to begin assessing and monitoring air quality and to obtain a sample of the product for testing, if able. No fumes were detected or discoloration was found, the Coast Guard said. A morning overflight was conducted by a Coast Guard Auxiliary aircrew with no reported findings. An additional overflight was conducted by a NOAA aircraft utilizing Hyperspectral imaging and the results are still being analyzed at this time. A NOAA boat crew, aboard a 41-foot vessel, is also in the process of placing a small weather buoy at the site to assist with monitoring the on-scene weather. Crews from T&T Salvage are staging and making preparations for a scheduled first-light dive on the wreck Tuesday morning to attempt to identify and secure any leak, pending weather and site conditions. They will be accompanied by a fire boat from the Sandusky Fire Department, aboard a 28-foot fire boat, as a dive safety observer. The Coast Guard established safety zone, located 3 nautical miles east of Kelley's Island Shoal extending 1,000 feet around position 41-38'21"N, 082-29'35"W, remains in effect and is closed to all traffic until canceled. No vessel may enter, transit through or anchor within the regulated area without permission from the Coast Guard patrol commander, Station Marblehead, which may be contacted via VHF-FM ch. 16.